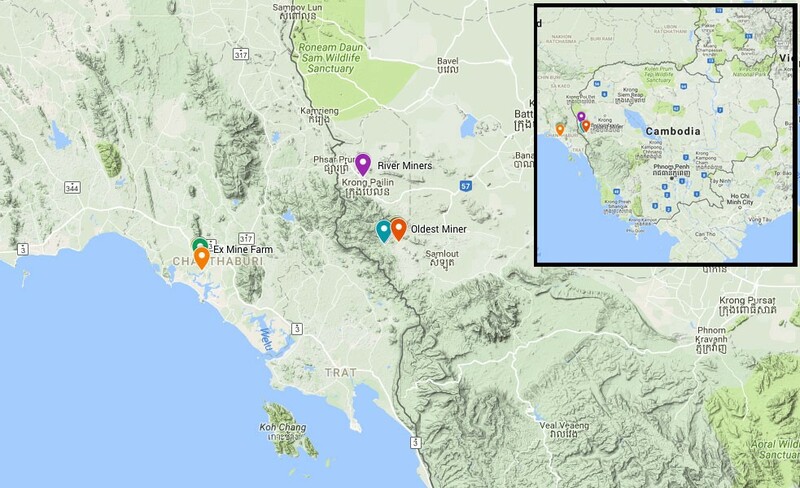 During the end of March and the beginning of April 2017, I was part of a gemology expedition searching for gemstones that originate from mines in the Pailin/Chanthaburi area. Though in two different countries, the region around Pailin, Cambodia and Chanthaburi, Thailand have a very interrelated history when it comes to politics, mining, and geology. Separated by about 90 km of road, the two regions consist of several inactive volcanoes and valleys between them where most of the mining occurs. The Pailin/Chanthaburi region is most well know for Rubies and Sapphires but some other gemstones are found in the region as well. 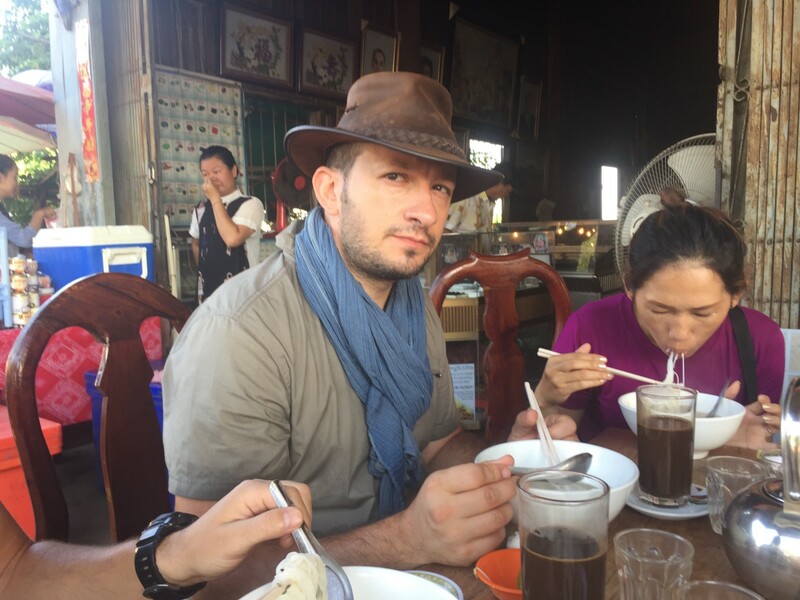 Our exploration of the region began on March 28, when we had breakfast at the Pailin gem market. The market consists of several shops on and around the NR57, across from the stairs leading up to the Phnom Yat Pagoda. There is one shop that is both a gem gallery and a restaurant and this is where many of the gem merchants have breakfast together. This was our ritual for our entire stay in Pailin: We would leave our hotel around 7:30am and head to this restaurant and get a table out front. After a breakfast of noodle soup, the merchants would bring different parcels of stones for us to see. Some we would buy, some we would turn away. 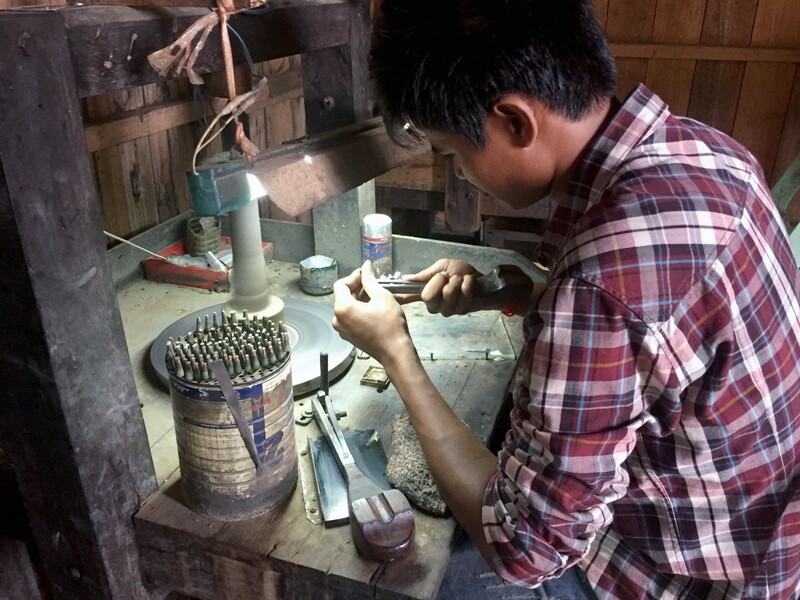 Pailin is a quiet town with an equally laid back gem market, so it was no problem for us to spend several hours at this table looking at stones or to head to some of the adjoining gem shops for an hour or two at a time. 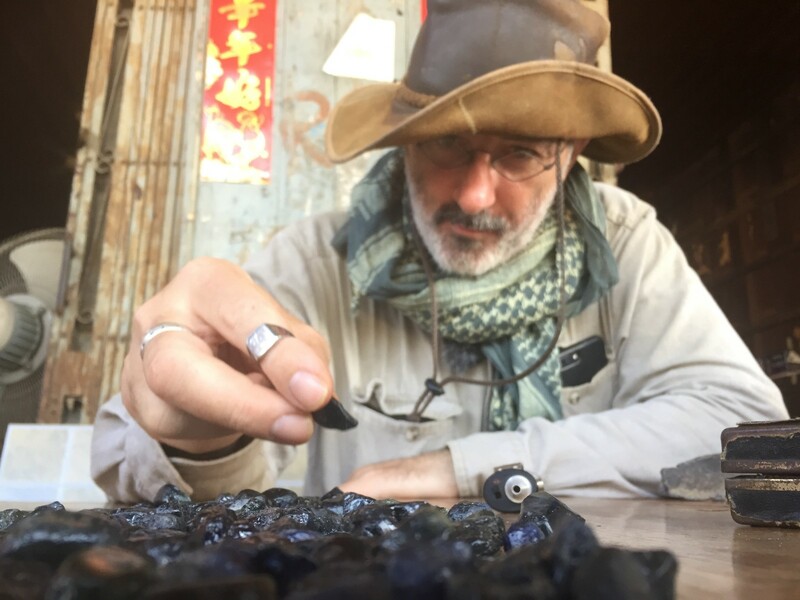 Our team leader, Vincent Pardieu, would use these opportunities to share a bit of his wisdom about the local gem trade and about the stones that we would see. We saw many parcels of low grade corundum, small sapphires and rubies that had poor color and clarity. One thing we learned was that around the year 2002 (if I remember correctly), gem burners in Chanthaburi discovered how to treat the poorly colored corundums with heat and the chemical beryllium to change them from cloudy bluish-red stones to clear, glowing orangish-red beauties. We saw many of these treated rubies and the transformation was pretty remarkable. 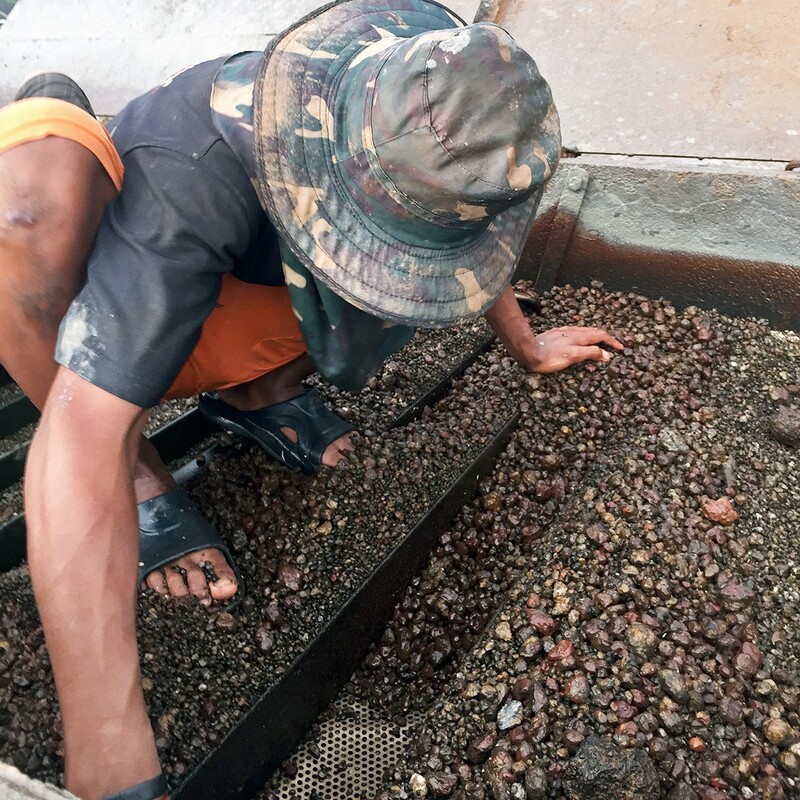 The rough, untreated stones are essentially worthless because of their poor color and clarity but the treatment gave the stones a fresh breath of life and in turn has reinvigorated the whole mining region as suddenly they have a huge amount of previously worthless stones that they can treat and sell. After breakfast on our first morning, we wanted to see some mines. 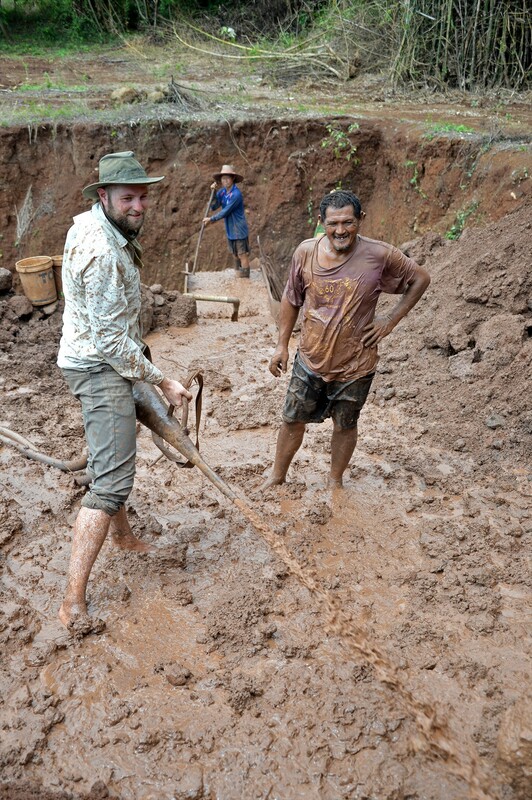 Our mission was to collect stones from as many of the local mines as possible. 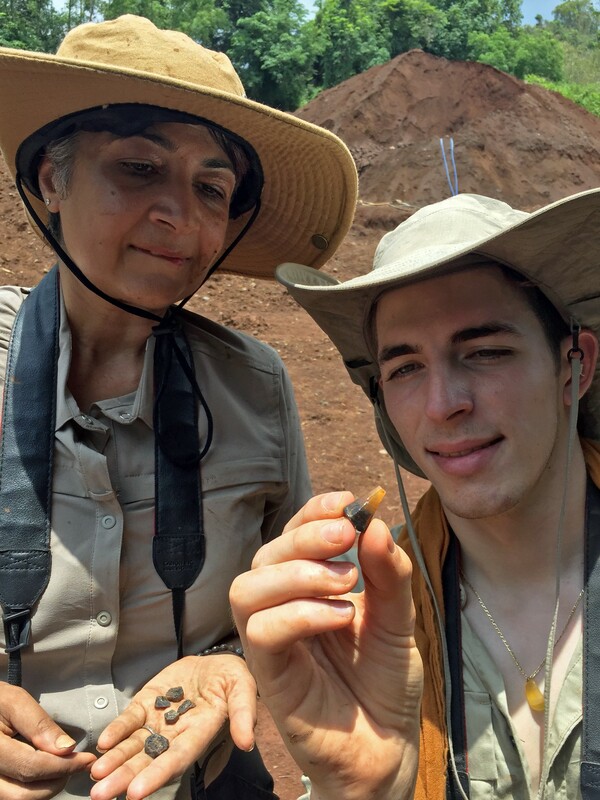 We needed to get them directly from the source so they could be part of a research collection used for doing Origin Determination at a gemstone laboratory. We had our guide Sovanny with us who is from Pailin and knows many of the merchants and miners. She was able to arrange for us to visit quite a few different sites. You can’t really talk about Pailin without talking about its history. 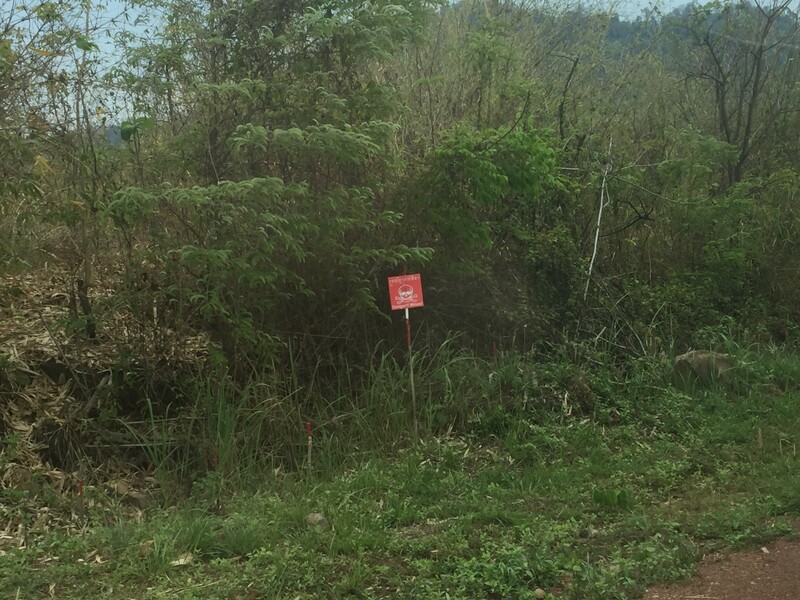 Many of the mountainous jungle mining sites we visited were quite dangerous because they are littered with undetonated landmines, remnants of the war-torn era of the Khmer Rouge. Aside from the landmines, there is also a region of protected land in the area known locally as “MJP land” (Maddox Jolie Pitt Foundation). 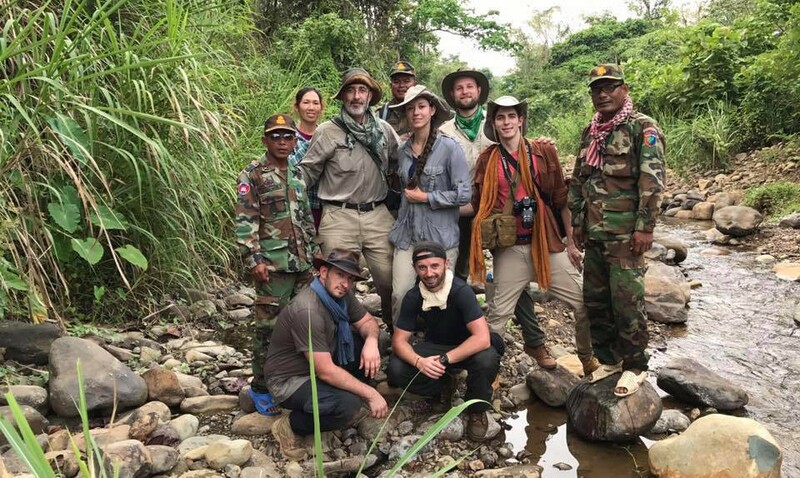 One of Angelina Jolie’s adopted sons is from Pailin so she set up a conservation area around his home village to protect its jungles from being cut down and turned into foreign-owned plantations, as has happened to so much of Cambodia in the last 50 years. 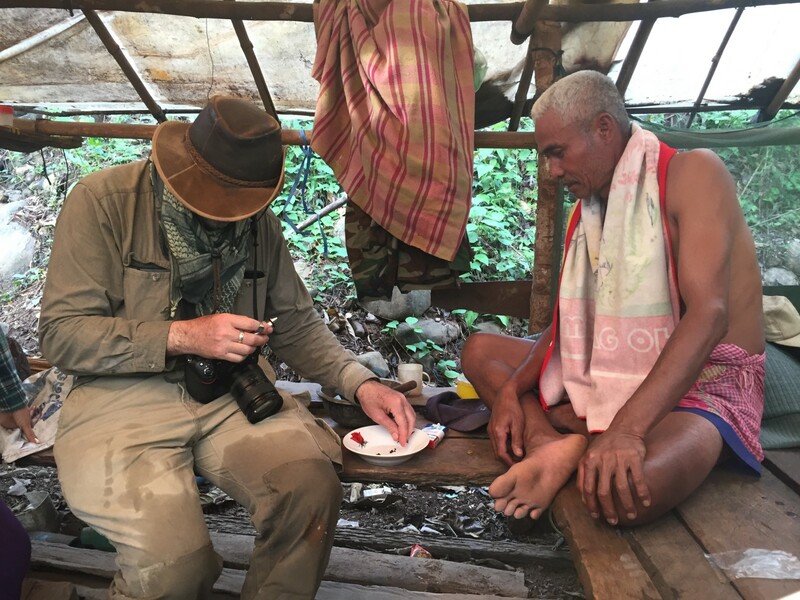 Loaded in our van, we ventured into the protected MJP jungles inside the Samlot district to see what we could find. 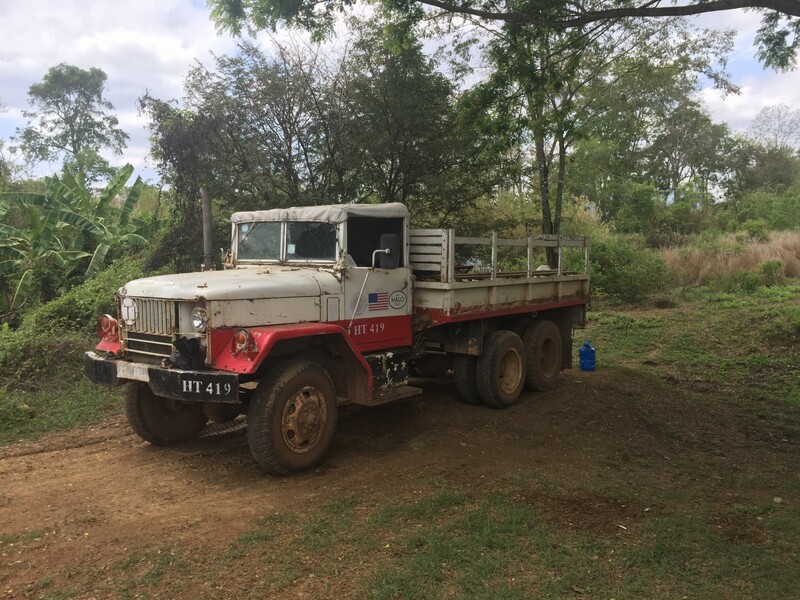 En route, we saw a truck from the Halo Trust, a group that is working to find and remove these landmines that injure and kill hundreds of people each year. We stopped to see the truck and meet it’s driver. While there, we saw a ring of sandbags containing the undetonated mines that they had recovered. It was a good reminder for us about how careful we had to be while trekking through this jungle. Any straying from the roads and paths could result in the loss of a limb at best. Luckily, we had guides along the way and we were relatively safe the entire time. When the van arrived at its first destination, we were greeted by a Cambodian military officer in uniform. 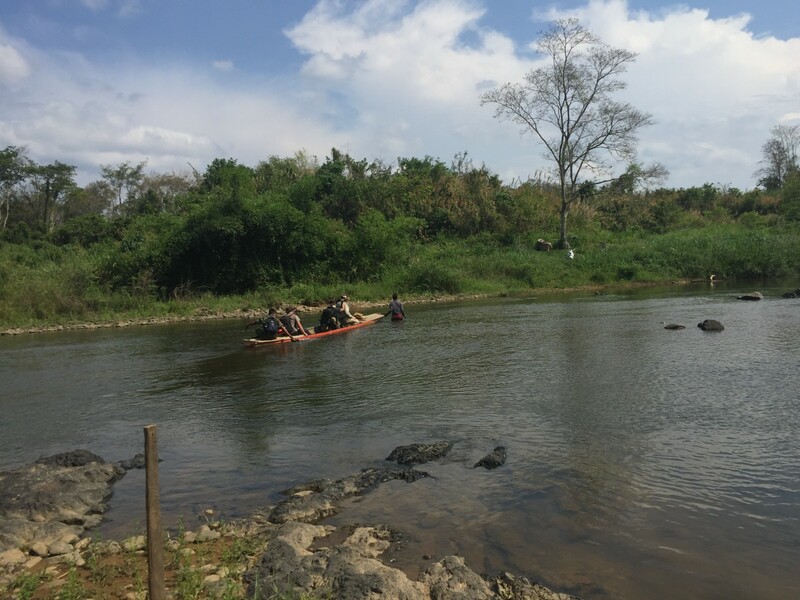 He lead us through a jungle path to a river which we had to cross via a small canoe, five people at a time. Once across, we continued along the small path until we reached another river where we discovered two miners. One of the miners was 72 years old and he told us that he was the oldest miner in the area. 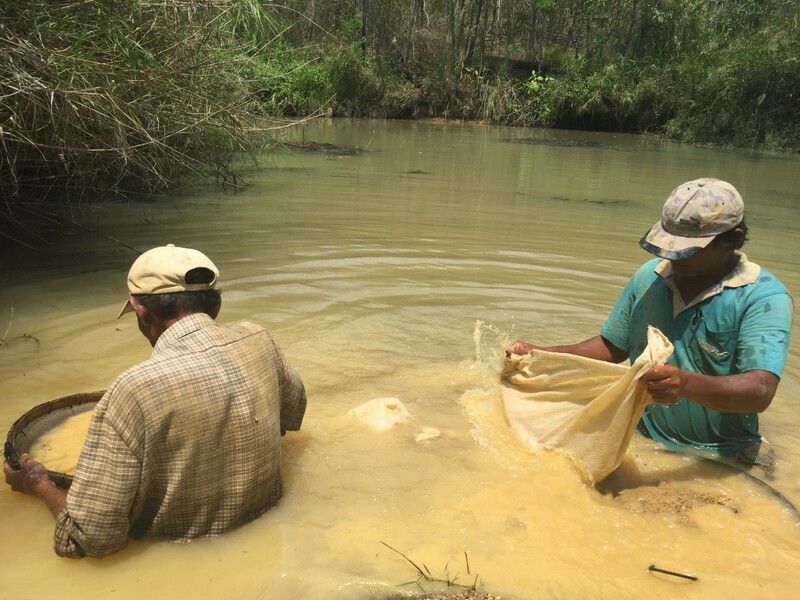 It seems that even though the land is protected from mining by MJP Trust, the local custodians of the Trust have given permission to a handful of artisanal Cambodian miners to work. As long as the mining groups are small, spread out, and don’t harm the environment, the conservation group allows them to earn their living this way. This also helps the Trust, as the miners are a good source of up-to-date information on what’s going on inside the protected area. Some of the miners have been here for up to 15 years and they regularly move from place to place, looking for new spots to hunt for stones. We were told that there were eights miners spread around the area when we visited. 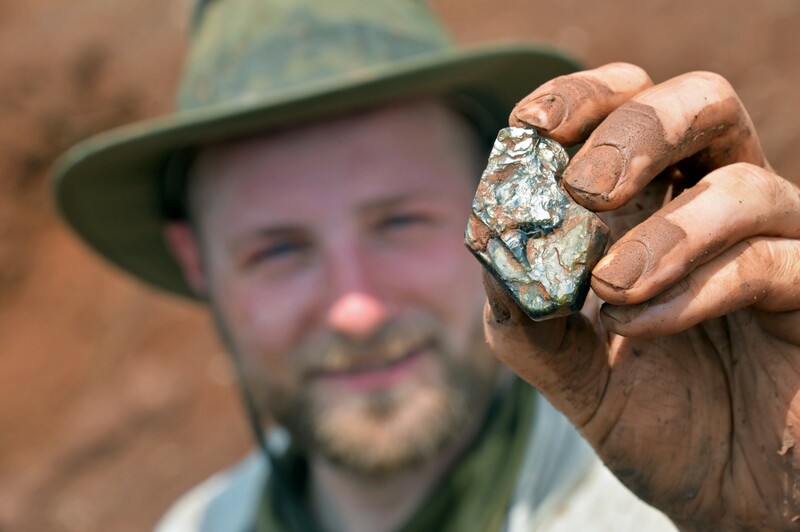 The technique we witnessed was one of the most simple and ancient methods of mining. 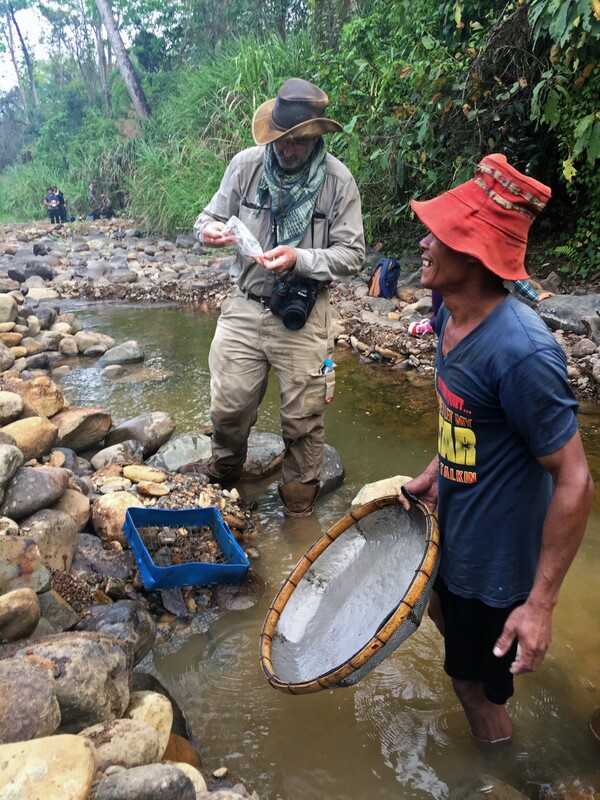 The miner gets into the cloudy yellow river which is about waist high with a sifting bag and a fine straining basket and proceeds to sift through the dirt and mud at the bottom looking for precious stones. He fills up his sifting bag with rocks and mud from the bottom and then pours that into his basket, where he shakes and rinses it in the water, periodically lifting it up to see if anything colorful is left in the basket. 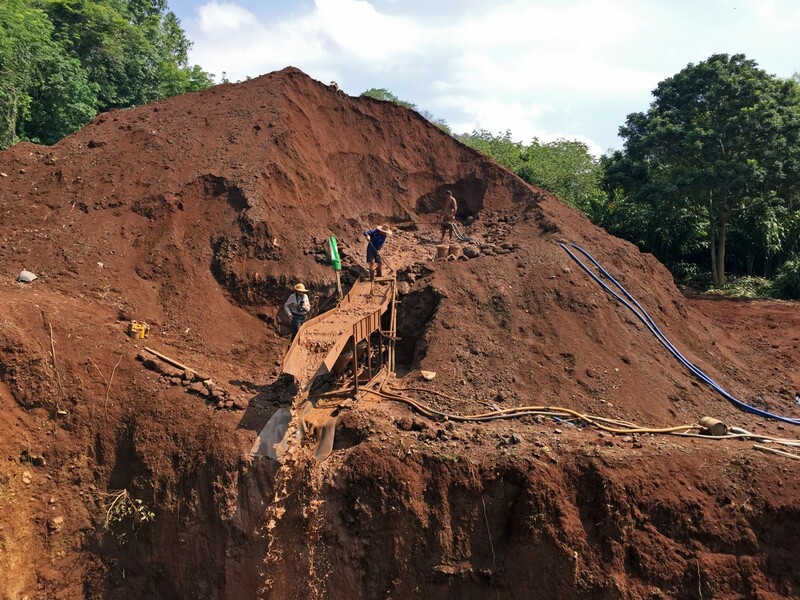 This is a very slow method of mining but it costs the miners nothing but their own time, so it’s a potentially low cost way for locals to make a living. The miners eventually got out of the river to show us the stones they had found over the previous weeks. We got to see a nice sample of about 15 small pinkish-red rubies, which we purchased. 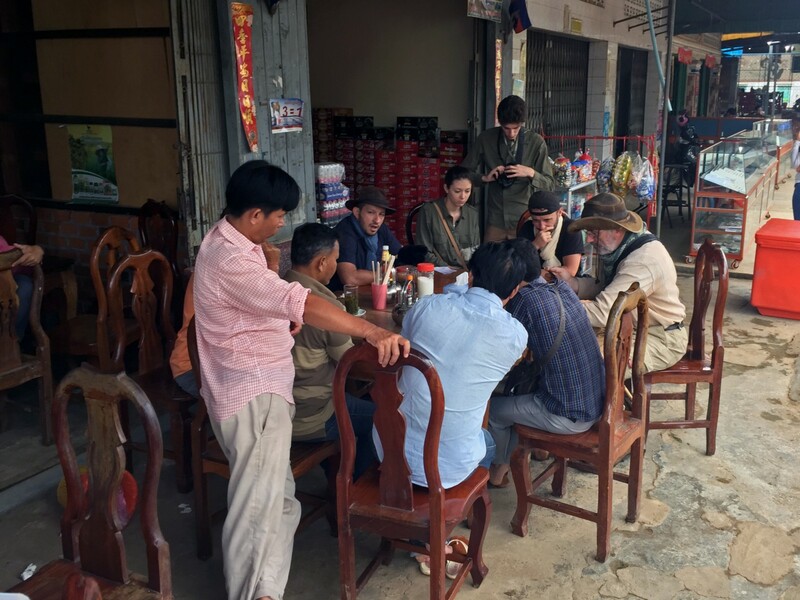 We spent about 20 minutes talking to the miners on the bank of the river with the help of Sovanny as our translator. After departing from the two miners, the soldier lead us to another site that was about ten minutes away on foot. We met two other miners who were sifting through small pits that they had hand-dug, looking for gemstones. 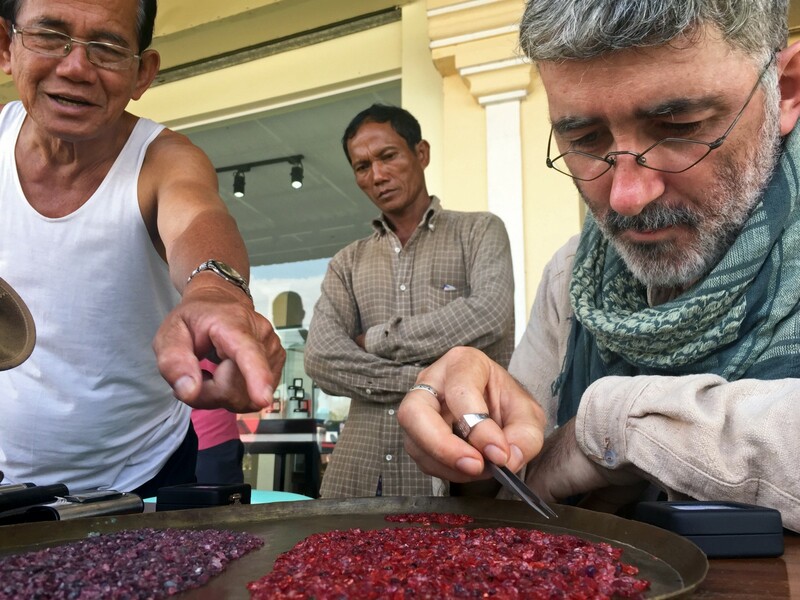 We bought about 15 more pinkish rubies from one of the miners, which he said was his yield from the previous week. After the second mining site, we continued on via motorbikes and arrive at a third mining site that was being used by one miner. This was another alluvial deposit in a river. I was told that this area had already been mined heavily by the Thai’s in previous decades. The path along the river was full of rocks and boulders that had been pulled out of the water by previous miners. We walked a fair amount on this rocky path until we found the spot we were looking for. 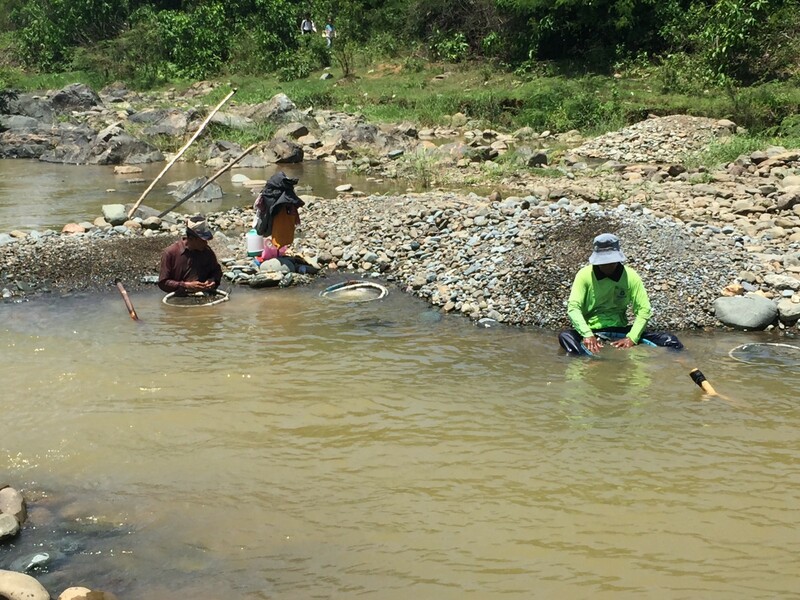 One lone miner was situated in the water in a similar fashion to what we had seen earlier in the day: He was using a basket and a tray to sift the rocks and mud looking for precious gemstones. He had been working all morning and was getting tired but he was happy to let us watch him do his work for a bit as he finished up for the day. Afterwards, he showed us what we had found recently and we got to see more small pinkish red ruby specimens that we were learning were typical of the area. After hanging out next to the river for a while, we rode with the soldiers on the back of the motorbikes to our final stop which was a small jungle house where some miners and their families were enjoying the evening. We looked at our final few parcels of local stones while the wives prepared dinner for the miners. We inspected several parcels. New bags of stones kept appearing from unseen pockets as soon as the previous ones were purchased. We left as the sun started going down so we could avoid the mosquitos and the possibility of malaria. The weather was poor on the second day so the possibility of visiting a working mine and using the camera equipment was low. We decided to spend the day looking through the market to see what kind of stones people had been buying from the local miners in the last few months. The day started as usual with local merchants bringing stones to us after breakfast. We spent a lot of time comparing the unheated local rubies with the beryllium treated ones and reflecting on what it meant for the gemstone industry to fear the idea of a heat treated stones when maybe 90% of the stones coming from this region are unsellable without some sort of treatment. One moment that I particularly enjoyed was when we visited a shop that had a couple of guys in the back faceting rubies and sapphires. As a gem cutter, I am always interested to see people of different cultures cut in their unique way. The guys we saw had the stones attached to a dop with wax and the dop was attached to a wooden hand piece, identical to the type we see in Thailand. The hand piece, like a simple version of a Raytech-Shaw/Imahashi hand piece, would let the stone freely rotate. It didn’t have indices but the faceter seemed to know how far to rotate the stone to get the index he wanted. It could also adjust the angle of the stone though I never saw him doing that. He was going fast and, as you can see, the tin can next to him had about 50 small dopped stones that he was working on, one after another. It was great to get to see such a wide variety of corundums from the region. We also saw a lot of stones that weren’t from the area. Those were interesting for the purpose of contrasting and comparing to the local corundums but for our purposes we weren’t interested in buying stones from other regions. We spent a lot of time going back and forth between the natural rubies and the beryllium treated ones. In the end, I found two small ones that had the exact color of a pumpkin that I am going to facet and use for a Halloween “Jack-O-Lantern” themed ring. Both stones are from the Pailin area and were heat treated in Chanthaburi. 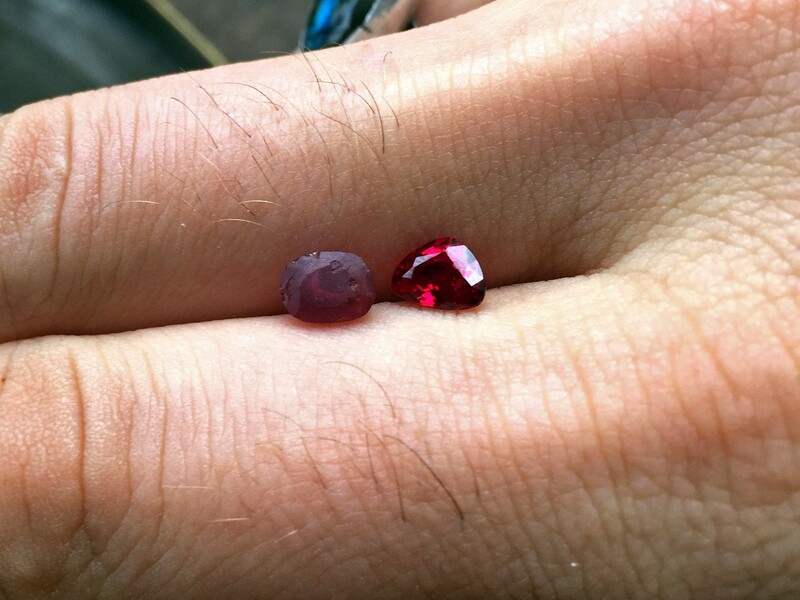 In the picture below, you can easily see how the natural stones on the left have a bit too much blue in the red to really be called rubies and to be profitable. The beryllium treatment takes out a lot of the blue from the stones leaving them with an orangish tint. The treatment also heals the fractures in the rough stone meaning there is more clean stone to cut and so in general you end up with bigger cut stones than what would have been possible with the unheated material. After a long morning at the market, we decided to pay our respects to the Phnom Yat Temple. We crossed the street and trekked up the numerous stairs that lead to the top of the sleeping volcano. This temple is especially important for the history of Rubies and Sapphires in Pailin. 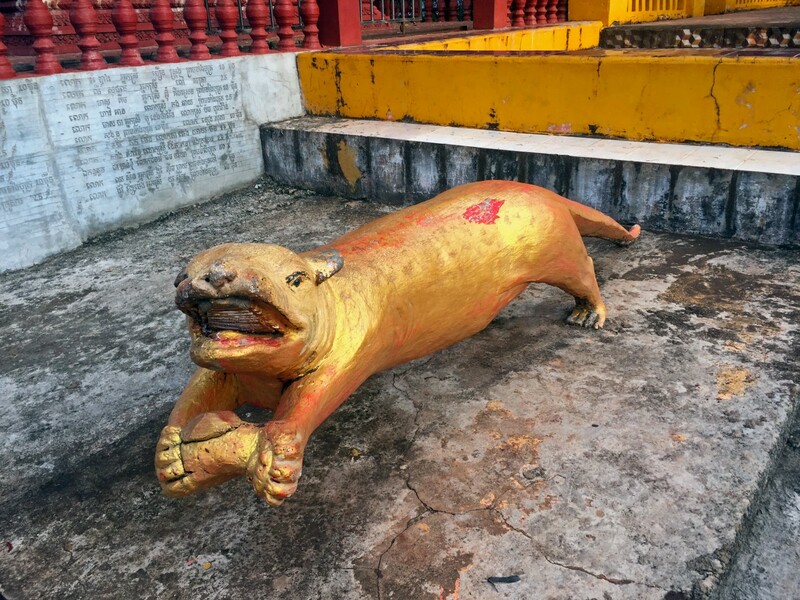 Once of the first things you see when you get to the top is a statue of a golden otter playing with a rough stone. This statue reflects the local legend that tells of how people first discovered the stones. The story says that Burmese merchants had come to the area and were hunting in the forest when they saw an old woman who greeted them. They didn’t know it at the time, but this wasn’t actually a woman, it was a nature spirit named Ye Yat. She told them that they shouldn’t kill the animals but if they went down to the river they would see something that would give them a better livelihood. The migrants went down to the river and saw two otters playing with shiny stones, one blue, one red. The migrants knew what the stones were and they started digging to find more rubies and sapphire. Aside from the statue of the otter, there is also a small temple to the nature spirit woman, Ye Yat. The locals bring offerings to her for giving their ancestors the inspiration that let them find the lucrative stones that provided their families with money for generations. On our last day in Pailin, we had breakfast at the market and then headed to one last mining site. It wasn’t too far from the town center. We followed a road to the edge of town and turned down a dirt path to follow the river. We parked and headed down the bank where we found two miners sitting in the river looking for stones. This is a rare example of a mining site that is renewable. The miners have dug pits in the middle of the river with a ring of rocks around it so that as the river current passes their pits, it would drop the heavy rocks down in them. The miners use a shovel with a long handle to pull a pile of rocks from their pit and put them sifting baskets and then sift in the same fashion that we had witnessed at the previous mines we visited. They only mine in the river during the dry season because during the rainy season, the water is too deep and they can’t safely sit in the river anymore. After we observed the miners for a while they got out of the water and showed us the collection of stones that they had found in the past weeks. Both of the guys were in good spirits and smiled and laughed a lot as we negotiated prices for their findings. We were able to get samples from both miners and also hear stories about life as a miner and we also heard a horror story because one of the miners was missing a foot. 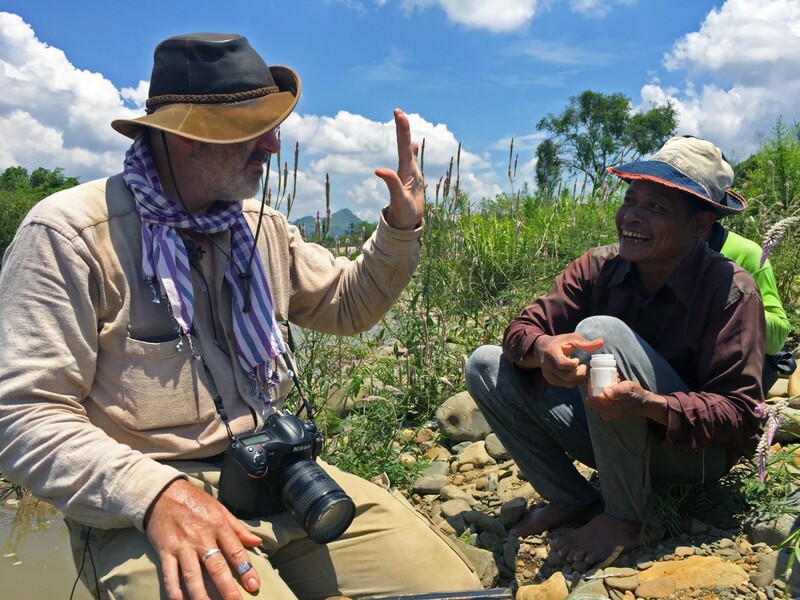 He told us he used to harvest bamboo and one day he stepped on a landmine and lost his foot. Now, he must walk with a large stick so most types of jobs would not be possible for him. Luckily, he figured out that he could easily sit in the water all day and now he makes his living as a river miner. Our journey in the Chanthaburi side of the border started at the temple on top of the Khao Ploy Waen Volcano. The name of the volcano translates as “Mountain Gemstone Ring.” The ring around the volcano is the area where you find the gemstones. In the distant past, magma from the then-active volcano brought gemstones with it to the surface and then when the gem bearing magma cooled, it turned into basalt rock. The corundum was stuck inside the new basalt and frequently are etched from their exposure to the hot magma. Sometimes there are other minerals in the basalt, too. In Burma, they build their temples on top of mountains in order to give respect to the spirits of the mountain, prevent earthquakes, and keep the local spirits happy when they start mining. Burma has many earthquakes and the Burmese believe the earthquakes are caused by underground snakes, so they do whatever they can to appease these spirits. 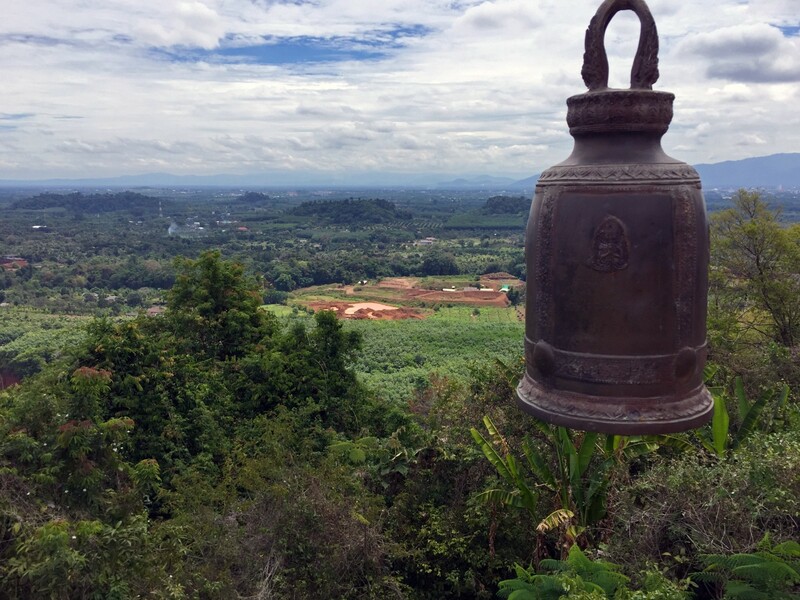 Since this region of Thailand was settled by Burmese miners, their customs migrated with them and now Chanthaburi also has mountaintop temples. This hill and it’s temple are sacred to the local people and therefore this hill itself has never been mined. From the top of this temple, we could see mines all around us. We had heard time and again that there no more mining in Chanthaburi. Even on our way up to the top we met a local man who told us that there hasn’t been mining in the area in over 20 years. Little did he know that from the top you could see at least 8 working mines if you look toward the east. The first mine we visited was run by a Mr. S and his wife along with one business partner who knows about mining engineering. The mining land is adjacent to their home, so every year, they use an excavator and dig a huge hole somewhere around their house and spend the dry season sifting through the giant dirt pile, eventually returning all the dirt back into the hole, minus all the sapphires and rubies that they pull out. We had a great day with the miners. We got to get involved with the mining process instead of just watching. 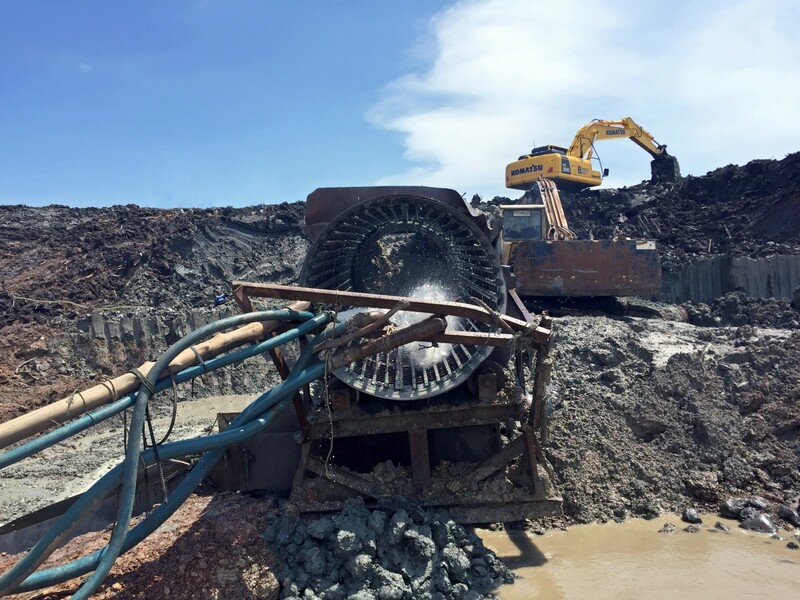 The mine can be run with just two people, one man shooting the pile of dirt with a water hose and another person on top of the washing plant, keeping big stones out of the pulsating jig that collects the precious corundums and making sure everything is running smoothly. We arrived just as they were starting the day. Essentially, they want to liquify the entire pile of dirt and send it through the washing station but this takes time so they attack the hill, bit by bit. They use recycled rainwater to spray, so it’s a great example of using as many nature-provided resources as is possible for mining. After watching the miners work for a bit to understand their process, they invited us to take charge with the water hose and start liquifying the dirt mound. As the water turns to mud, it runs down hill into the washing plant where it gets sorted. The big rocks which are never valuable are pulled out by hand and are thrown into the giant pit below. The excess water also runs into the pit, eventually returning to the top via a water pump. As we traded positions, I took a turn pulling out all the big rocks from the sliding mud so that the guy on the washing plant would have less work to do. While doing this I noticed a flash of gold that I had seen on some of the other rough from this mine and I pulled it out, revealing a huge sapphire. It was a very satisfying feeling. Vincent said he had never before seen anyone pull a big sapphire out of the mud like that. We later bought the stone for research purposes. Once the pulsating jig was full, the miners turned off the water and let the washing plant empty. Then they started the next step which was sifting through the small pebbles in the machine and pulling out all the corundums and throwing out all the rocks. Once this had been down we washed up a little bit and met near a table towards the house. We sat down with the miners and looked at everything that had been found today and everything that had been found in the recent weeks, to try and put together a parcel of stones that we wanted to buy. 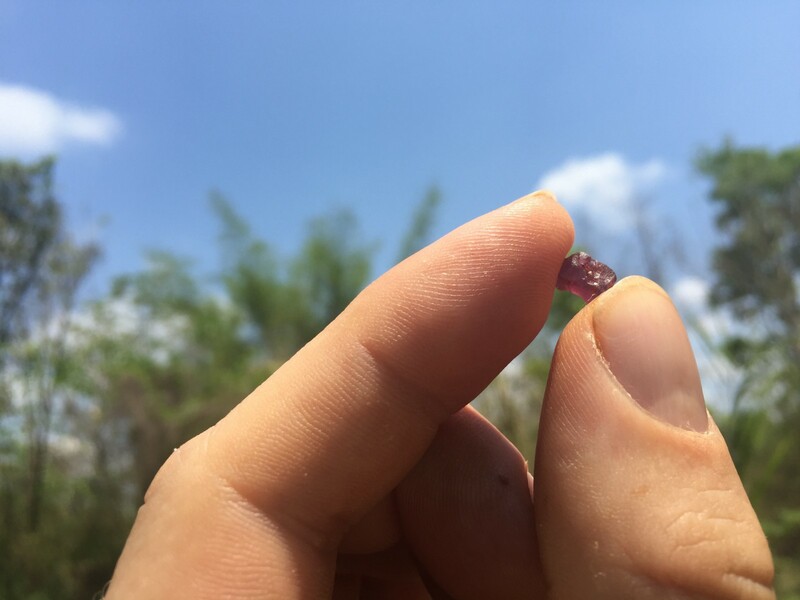 While looking at all the rough stones from the mine, we learned that in the west part of the Pailin/Chanthaburi area, there are lots of star sapphires. These stones are big, dark, and have a high concentration of iron which causes needles and platelets to form in the stone, creating the star phenomenon. Sometimes, the needles and platelets are organized in two different directions, creating two different 6 ray stars which makes a 12 day star. Depending on the concentration of the trace elements in the stone, sometimes the two different stars are slightly different colors. By Contrast, on the Pailin side, there are no needles, only particles which refract light and create a silky looking stone. After purchasing our stones and leaving the first mine, we jumped in the van and rode to a second Khao Ploy Waen called Bon Ka Cha. mine The soil composition of the Bon Ka Cha mine was very different than the previous mine we visited. Where the corundum were being extracted from soil, here they were finding them in a layer of pyroclastic ash that rested a foot or two below the ground. The swampy area was under water 100 years ago and we found lots of marine evidence. Shells of all sizes littered the top soil. The scale of Bon Ka Cha was huge compared to the little family mine we had just seen. This one was using several excavators to move soil and expand the giant hole they were working in. The mine is large but its operation is relatively straightforward. The excavators are all making large piles of dirt by scraping down the edges of the hole, making it bigger in the process. Once excavator takes these piles and places them in the trommel. They need a trommel here because the dirt has clay in it and is too sticky to be directly mixed into mud. The trommel spins the dirt with water, essentially working to sift the dirt into powder and simultaneously mix it with water. The consistency has be to perfect for the mixture to be able be pumped away. A water pump and pipe take the mud up the hill and into the washing plant. Once the mud mix reaches the washing plant, gravity pulls it into the pulsating jig. 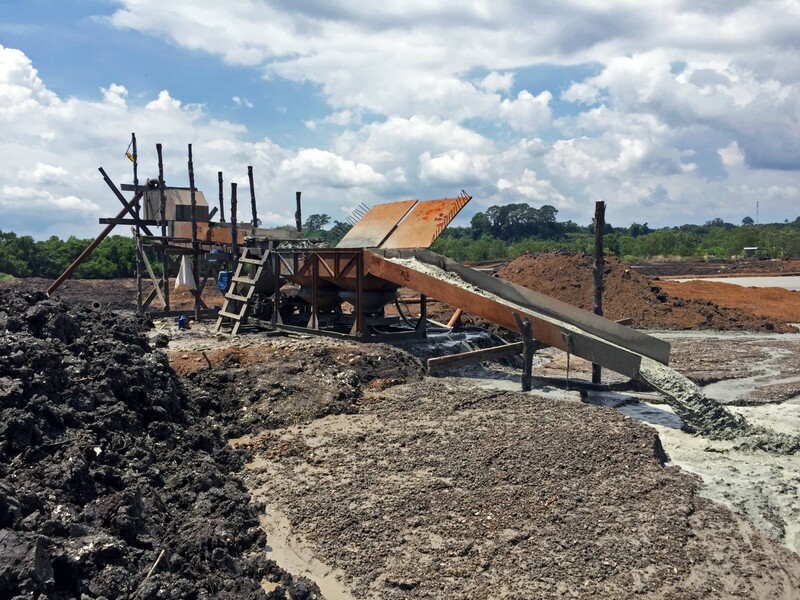 Just like the previous mine, the heavy material falls to the bottom and the lighter material and dirt gets washed into the pond. 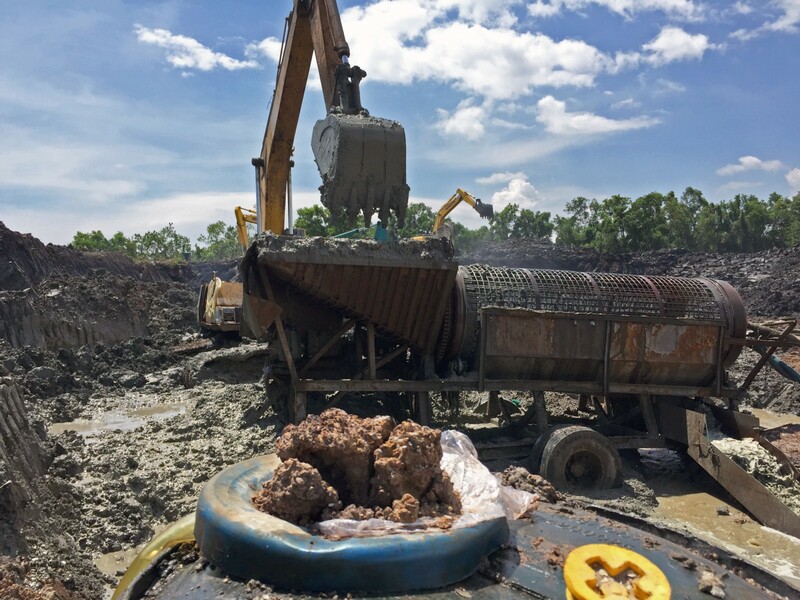 Once the pulsating jig is full or the day is over, they turn everything off and open up the jig to reveal all the stones that the plant has collected for the day. They them fill up bags with the rocks and take them to another location to sort. Since the operation is so big, the bags are large and numerous. During the course of the day we met the owner of the Bon Ka Cha, Mr Rainbow. He is a senator for Chanthaburi government and has been a miner at this location for over 30 years. Mr. Rainbow told us he thinks the mine has 5 more years of production left in it. 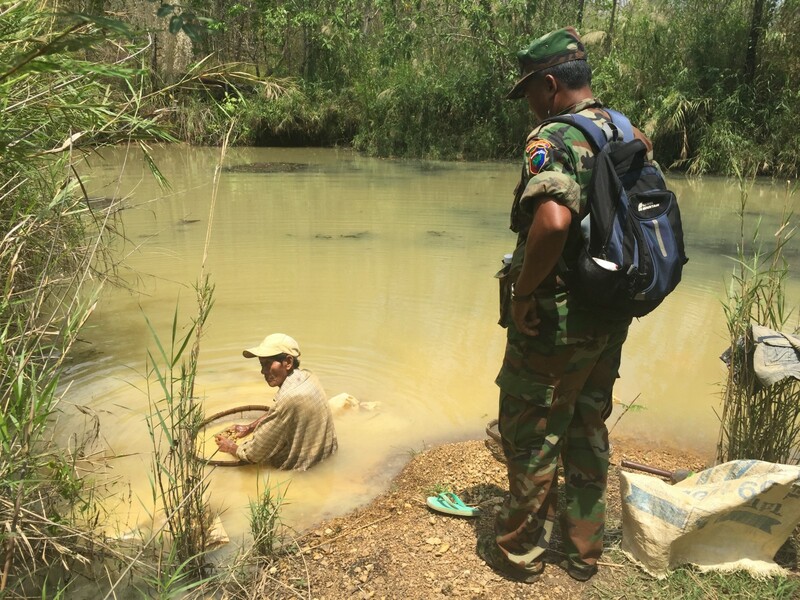 He is also about to start a mining operation in Pailin. The final mine we went to was not actually a mine. It was a field that used to be a mine but the landowners had filled in the holes and turned it into a banana plantation once the mine had stopped producing gemstones. The whole site had been transformed into something that was still useful and profitable for the land owners. This was a great example of a conservation friendly mining practice, where the land was used to harvest gems but it was not at all destroyed and now remains important for the local economy. This is a somewhat common occurance in this part of the world. The volcanic soil the comprises the area is very rich in minerals and very fertile. 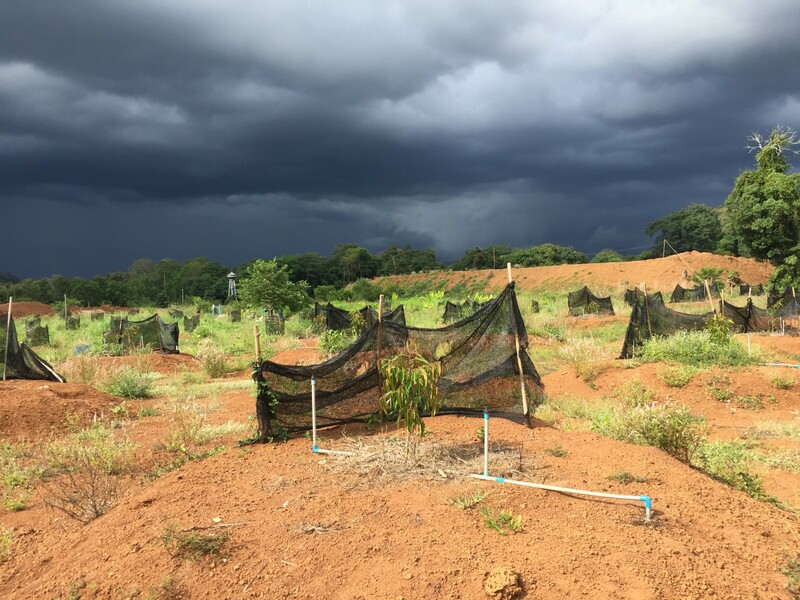 The banana is usually the first thing to be planted after mining as it’s good for reconditioning the soil and preparing it for future crops such as durian, papaya, and dragon fruit. This mine was our final stop for the expedition. We took our last photos and wrote down our last notes just before a storm rolled in. We headed back to our hotel to pack our bags and head to the bus terminal to hire a van to take us back to Bangkok. All in all it was a great trip, a great adventure, and a total sucess. We learned a lot, got many stone samples, and made new friends. Hughes, R.W., (1997) “Death of the Thai ruby” AGA Cornerstone, Summer, pp. 1, 3–6.